Having a good garbage disposal can save time and effort when it comes to keeping a kitchen clean. In-sink disposals have become a common accessory in most modern homes, and likewise, have become highly relied upon tools. Just like any mechanical tool, keeping it in working order can require a bit of care and maintenance. One of the most common issues that arises is rust forming on the blades inside the disposal. Most steel products rust over time, and depending on the type of steel used in making the blades, there is a difference in how soon they might rust. Rust stems from the oxidation of the iron in the steel when exposed to moisture, and one place that is almost always encountering moisture is your sink. There’s a quick and easy home remedy to clear the rust and have your disposal smelling better at the same time. To keep the rust from returning there are several rust blocking products on the market, but before using anything be sure it is safe to use in your disposal. Drying the sink with a towel or running a dehumidifier in the kitchen can help keep excess moisture away from the disposal as well. If the disposal still isn’t running as smoothly as it should be there may also be a small clog inside. An easy way to help remove any clogs from your garbage disposal is to put one cup of baking soda in the disposal and then pour in one cup of vinegar. The mixture will foam and break up the clog, then after a few minutes pour some boiling water down the drain and run the disposal to clear any debris. 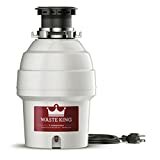 If you have tried to remove rust or unclog your garbage disposal but it is still not working properly, maybe it is time to replace with a new one. Learn more about the best garbage disposal and things to consider. Having a disposal unit that has the blades made from stainless steel will slow down the rusting process and it lasts longer than standard steel, but eventually rust will show up on those blades too. Stainless steel lasts longer than galvanized steel. 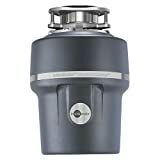 However, a garbage disposal that uses stainless steel as internal grind materials is usually more expensive than that that uses galvanized steel. 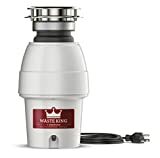 For your next garbage disposal, it depends on your preference whether you are willing to pay more for a stainless steel garbage disposal but get much longer warranty or want to pay less for a galvanized steel one.